Este apartamento em Nerja é perfeito para um casal ou férias de praia em família. O apartamento está em boas condições e tradicionalmente concebido e decorado. Cozinha totalmente equipada, banheiro de bom tamanho, 2 quartos espaçosos e um enorme terraço com vista para a praia. O terraço é maravilhoso - móveis ao ar livre, incluindo espreguiçadeiras confortáveis ​​e sala de jantar externa. Toldo grande proporcionando sombra nos dias quentes de verão. A vista do terraço é vista sobre a praia de Burriana e o Med. Atrás do Capistrano Playa você vê as montanhas. A cozinha está equipada com talheres novos, louças etc - ótimo para cozinhar alimentos locais e comer dentro. Existe um forno, microondas e geladeira. Ar condicionado instalado em todos os quartos de abril de 2017. O lindo complexo Capistrano Playa fica a 5 minutos a pé da praia Buriana, com lojas, bares e restaurantes com decks de praia supervisionados. Também está a 10-15 minutos a pé do centro da cidade - Nerja clássico, com as ruas estreitas e antigas que vão ao mar. Este é um apartamento para não fumadores - é permitido fumar apenas no terraço. Há aquecimento disponível para os meses de inverno. We stayed for two weeks in this beautiful appartment. Very nice seaview and good and full equipted appartement. The weather was very good and we spent almost every day some hours at the burriana beach. Also a lof of possibilities for a day out. And we stayed on our weight because of the steps we made. Isabel gave us a great introduction to the property. The apartment was very well equipped with all you would need for a short stay. The balcony was great for sun lounging and the sun was there to greet us in the morning for breakfast but unfortunately being February we lost it after four in the afternoon. Thank you Alex for your review. I am glad that you enjoyed both the apartment and Nerja. 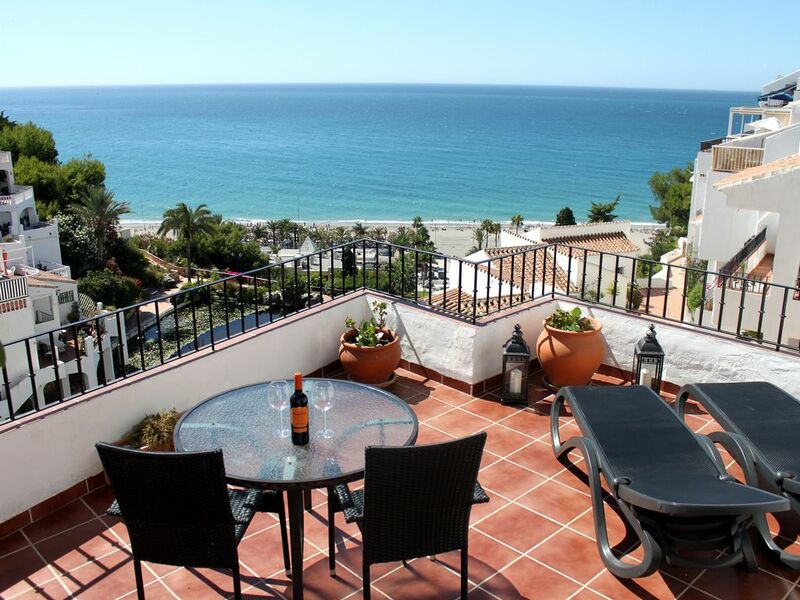 Please let us know if you would like to rent again the next time you are in Nerja. Location géniale avec une vue exceptionnelle sur la mer dans une résidence magnifique. L'appartement est très spacieux, lumineux, très propre, bien équipé et au calme. Nous avons beaucoup profité de la grande terrasse (nous n'avons fait aucun repas à l'intérieur) avec cette vue magnifique. Nerja est une jolie ville qui reste dans le style espagnol sans trop d'immeubles qui déguisent le paysage. Nous avons beaucoup apprécié notre séjour et espérons pouvoir revenir dans le logement de Jean qui nous a donné toutes les explications nécessaires pour passer de bonnes vacances. Nous recommandons !!!! THE place to come and unwind! This is just the ideal get away! The apartment is of a really high standard - all the equipment you will ever need, a beautiful terrace (with stunning views!) and really well thought out space internally. The bedrooms are a great size and the new bathroom made the end of each beach day very easy to manage before walking into town (or back down to the beach restaurants) for something to eat, or shopping for provisions to bring back to prepare. It really is all so easily accessible that even though we had a hire car, we didn't use it! A fabulous week of sun and relaxation with dolphins swimming past most days - you can't get better! Thank you, we do our best to make it special for our guests. Happy to enjoyed! We were extremely impressed with the apartment! The standard of the fittings and linen was excellent, The directions that Jean sends are concise and accurate and the complex was easy to find. We recommend you phone Isabel from the airport who will then be waiting to meet you. The apartment was very clean, the kitchen was well stocked with basics i.e. oil/condiments and all the pots, pans and utensils you would need.We spent most of our holiday relaxing on the terrace on the very comfortable loungers, The sun appeared over the tops of the apartments and villas opposite at about 08.15 until early evening when it disappeared behind Casa Loma. However, it was too hot to sit in the sun for long, so the retractable canopy was essential. We settled for a lazy holiday with little travelling about, though we did go to Frigiliana, which is a very pretty village only 10-15 minutes drive away.We can recommend both El Picoteo and El Boquetillo for lunch. We walked into Nerja a few times which was very pleasant.However,we mostly enjoyed our walks down the steps through the gardens and onto the beach before sunrise. It was very peaceful strolling through the shallows with only a few joggers for company and while it was relatively cool! There are plenty of bars and restaurants at the beach so it was very convenient, being only a 5 minute walk away. It's well worth a visit to the caves, as they are only 10 minutes drive away. At the end of the day we had a very pleasant relaxing holiday and the only downside was having just two weeks! We would definitely like to return for another holiday.Thank you Jean for a very pleasant stay at your apartment. Capistrano Playa é uma jóia arquitetônica que fica em uma encosta com vista para o mar. Sua localização é tão única - o mar Mediterrâneo de um lado - e as montanhas de Sierra Nevada do outro lado. Nerja fica a cerca de 45 minutos a leste de Málaga. Embora o Capistrano Playa tenha sido construído na década de 1980, parece uma vila espanhola de estilo antigo, cada terraço tem seu próprio estilo e estilo, não são semelhantes aos dois. É muito pacífico, lindamente projetado com jardins iluminados, passarelas, seu próprio lago ornamental e cachoeira. A praia de Buriana fica a poucos passos, e há também uma piscina comum. A Praia Buriana, a maior de Nerja, está repleta de restaurantes, bares e centros esportivos. Tem tudo que você precisa para umas férias de praia relaxantes. O centro da cidade de Nerja fica a apenas 10 a 15 minutos a pé, uma encantadora cidade velha espanhola, com ruas estreitas cheias de restaurantes, bares e todas as comodidades locais. As famosas cavernas de Nerja ficam a poucos minutos de distância.